I thought it best if my first post offers something constructive than just a "hello"! This is an A4 sleeve for printouts with an eyelet, so you can hang it. The main selling point for this was the fact that it only opens from one side; the top. Furthermore they are quite thick to provide a good degree of protection. A good tip. I'm generally strongly opposed to sleeving, but I've been wondering whether Zombicide would benefit if the players were able to write directly on the player boards to mark XP and chosen skills. With sleeves and water-based markers this would be perfectly feasible. I have laminated the character cards I printed from the Guillotine Games website - that works better with paper than laminating the light card that comes with the game. It costs about 60p or so per sheet (2 for an A4), and the laminated sheets will take the movement of experience markers better than card does. My issue with lamination was the heat produced by the process. I wasn't confident it wouldn't bend or damage the cards. My plan, when I've got the spare cash for a laminator and guillotine is to scan, print, and then laminate copies of cards on paper. That way I get nice laminated cards, but have the originals still also. This looks to be a cost effective alternative, though. I laminated the original cards and I wouldn't recommend it as they're slightly warped which makes them a pain to play with. Luckily I've got new copies of the cards because of the zombivor double sided cards so I will keep them and do as Scott and Stephanie are doing/have done and print off the cards from the website and laminate the paper. I second (third, fourth?) the print + laminate method, works great. You can get some warping, I've found the best way to prevent this is to ensure that the paper/card is both going into and coming out on a flat surface, so it's level all the way through. I'll often use some books stacked in front of and behind my laminator since it's a basic strip laminator and without this the paper is curved feeding in (which I assume applies a slight curve to the laminator pocket). Glad you're having success with the lamination. I wish I had a laminating machine, but I don't. So I am glad I found these sleeves. By the way, I forgot to mention, the price ain't bad... I found these for 0.70 € cents in a small shop around the corner. I got mine done at Staples. 1 A4 does 2 character sheets. at around £1.60, so it's a bit more expensive than your method, Gromaru, but not much! I looked at doing them at Staples, but then I worked out that by the time I'd done all the Season 2 Survivors I've got coming as well, it would be cheaper to buy a laminator and do them myself! 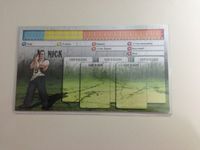 I have laminated all of my Zombicide character sheets, and highly recommend it. I used 125 micron sheets and a hot laminator and the results are spectacular. I wish I had a laminating machine, but I don't. You can get one for 20 Euros or less at Amazon, some even ship with a package of laminate and cutters to round the edges. This is an A4 sleeve for printouts with an eyelet, so you can hang it. The main selling point for tis was the fact that it only opens from one side; the top. Furthermore they are quite thick to provide a good degree of protection. Does anyone have a link to these things, preferably a US link? I've never seen these. I would like a link to buy those a4 sleeves as well! Where did you get these a4 sleeves? Sory for the necropost, but I did some digging around cause I recently bought a Zombicide game as well. Judging from the photo's in the OP it looks like these sleeves are "Leitz 4094". You can find them on eBay, but unfortunately they are pretty expensive at about 3 euros a piece. Did anyone find a cheaper alternative to these sleeves? I'd love to sleeve my character cards as well, but not at this price. They have a bad rep of being off size, and deservedly so. I bought 5 packs of 100, of which 2 of the packs didn't fit. I wrote a mail to Mayday and they sent me 5 packs even though 3 of them were perfect. I now have a bazillion sleeves so I guess it's not a bad deal. They're pretty aware the sizing is bad on their sleeves so they won't argue, but it might take some time until you got your game ready to play if you end up unlucky with the sizes. Hey thanks Julien, but I was talking about the big character sheets, which need protection from the dreaded score-slider that messes up the top of the sheets. For the dashboards I use something close to what the OP proposed. I found them at work, they're sturdy and the dashboard won't move an inch. How many do you need? At the moment I own Prison Outbreak and two separate survivors, so that's 8 in total. But I'm planning on pledging on the new kickstarter, so I have no idea how many characters will come with that. They're unbranded so I really wouldn't be able to tell you, sorry. The ones in your pictures are looking cheap and slippery, I wouldn't buy them. Yes, my thought exactly. I think I'll drop by an office supply store sometime to see what they have. I saw others do it and decided to give it a shot at work.. I laminated prints of the cards this time, but now that i know how to use the machine well, and played with thew laminate thicknesses (i use .5) im probably going to laminate the cards themselves. It wasnt until i played games with them laminated when i realized how much better it was. You can mark off how many actions you took.. mark off if you have Born Leader that round.. draw mustaches on them when its not your turn.. ect.. I love them, and in fact laminated a bunch of other game cards too. id suggest if you can, get them laminated.. find a store or print shop to do it, buy a laminator for 100 bucks.. break into a school and do it its the best system yet. Yeah, I'd prefer a non-digital solution as well. If I can't find cheap sleeves, I'll probably make scans and laminate those. I'm not a fan of laminating the original sheets.